Cylindrical cut, about 22 mm high. It has a wheel shape with an outer crown (Ø 25 mm) geared to the hub (Ø 6 mm) by 6 spokes (about 9 mm). Crown, hub and spokes have different thicknesses that give a particular sensation to the chewing, similar to the combination of crumb and crust of a good piece of bread; sensation which is greatly appreciated by gourmets. 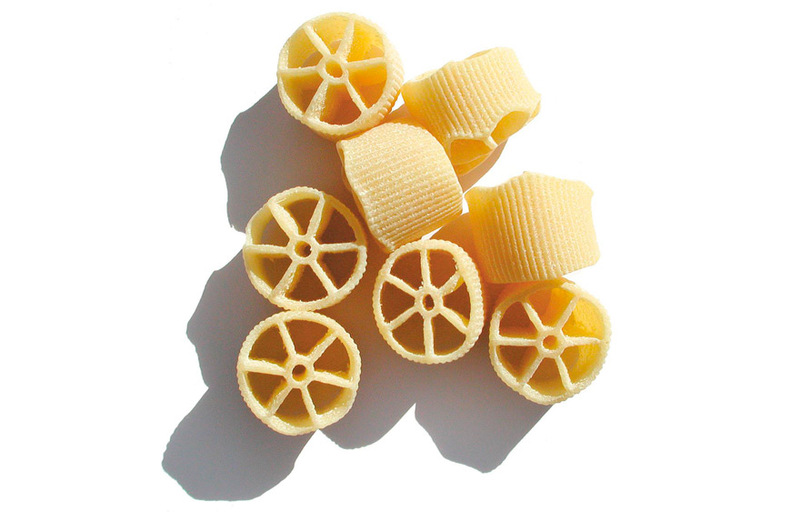 According to Salento tradition, the name ‘Ruote Pazze’ (Crazy Wheels) derives from its not so perfect round shape. Yet when cooked they do not go flat as it happens to ‘rigatoni’ and ‘paccheri’ but remain well taut. This allows the sauce to fill freely inside and remain there. With our ‘Delicate Method’ we obtain, as the picture shows, a porous ‘texture’ that is ‘open’ to absorb the sauces and create a perfect amalgam. Mention of the ‘Ruote Pazze’ mould is present in a 1938 inventory of our establishment. Since then, the ‘Ruote Pazze’ have had a great ongoing success in Italy and abroad, and they are present in the menus of many restaurants some of them among the most renowned in the world. In 2002 it won the prestigious Oscar of the National Association for the Specialty Food Trade at New York Fancy Food Show. The delicious quality of Ruote “Pazze” is mentioned in Ozpetek’s movie “Loose Cannons”… and not as a marketing device!